Wells Fargo has been a close service comrade of NHS this past year, and we’d like to thank them for all of their hard work! This past week they partnered with us for two days of meaningful community service. 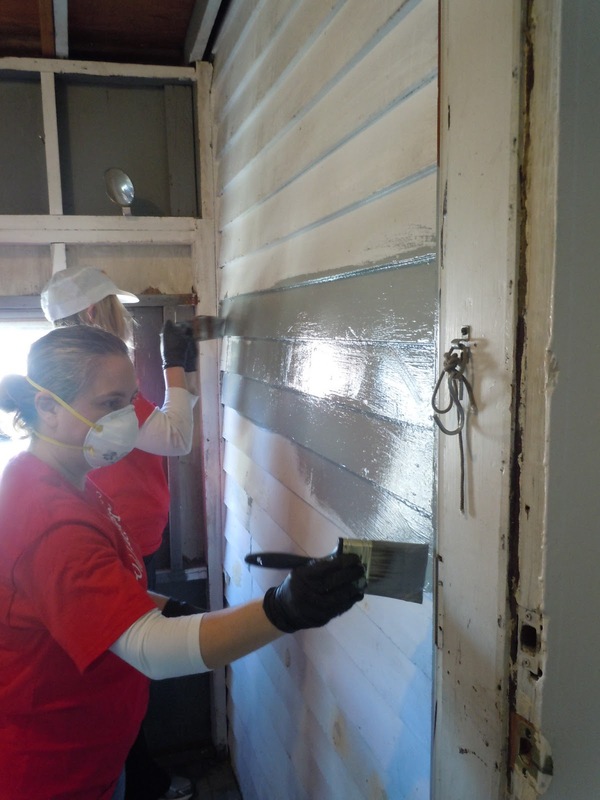 For this Day of Caring project, we chose to have our volunteers help us out at the home of an older couple who have been working to refurbish their second-floor rental unit. With retired home owner, Mr. Garland on his road to recovery after sustaining serious injuries while working on the house, it has become clear that assistance would be needed to complete all the work that remains. 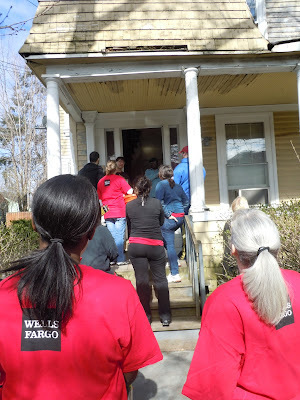 That’s where the Wells Fargo volunteers stepped in! 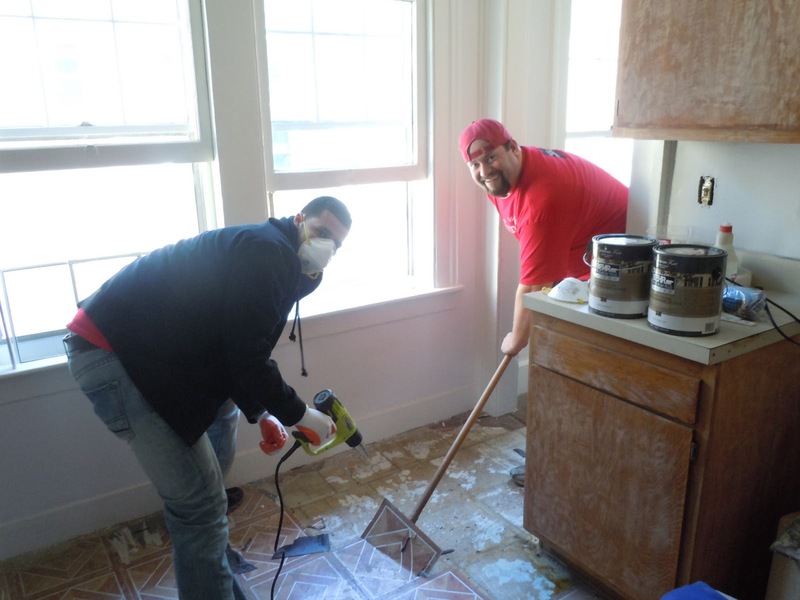 On Tuesday, 11 volunteers from the New Haven Wells Fargo region took to painting, scraping, sanding, and pulling up old vinyl tiles in the rental unit. Our group of lady painters was of the highest caliber, as not one smudge occurred in any of the three rooms requiring trim work and multiple coats of glossy paint. Several more hardworking guys took on the kitchen tile. Slowly but surely, they ripped up four layers of flooring to expose the original wood floors underneath. The team then pressed on to the stairwell, which hadn’t been painted in years and needed a fresh coat to pass inspection. Despite some precarious heights and balancing situations, the group was fearless under the leadership of Kim, the Vice President and District Manager of the New Haven Valley branch bank, leaving beautiful work in its wake. 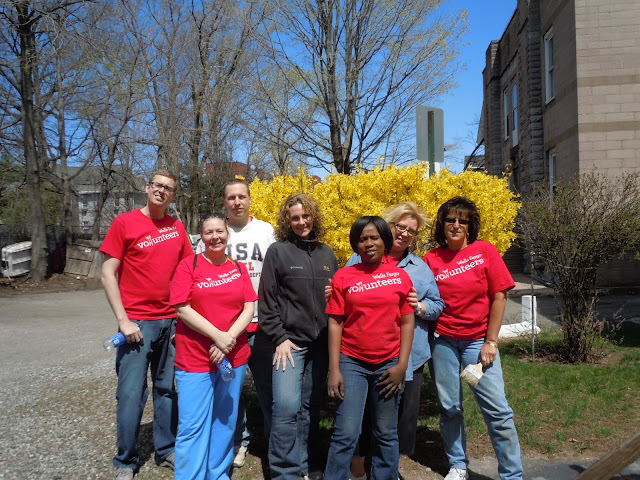 The next day, a group of 7 Wells Fargo volunteers undertook finishing touches and outside work. 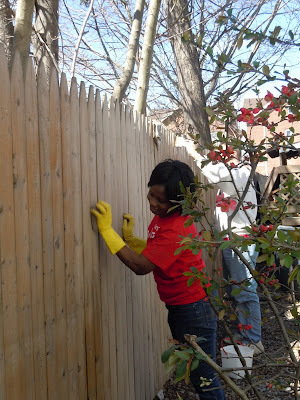 Half of the group took to the yard to sand and seal the fence straddling the property line. It was in need of some extra care for upcoming seasons, and the volunteers saved the homeowner weeks of labor. Meanwhile, within the house, other volunteers finished up the trim work in certain areas of the house. One woman took a heat gun to over four layers of paint that the house had acquired in its hundred years of existence. Another brave soul finished repainting the ceiling of the stairwell and other small, out of reach details that the previous day’s team couldn’t get to. A lot of ladder-holding and teamwork was needed, but in the end, the team prevailed! At the end of the work day, three members of the team painted the stairs in the stairwell as the final bit of work. They literally painted their way out of the house! 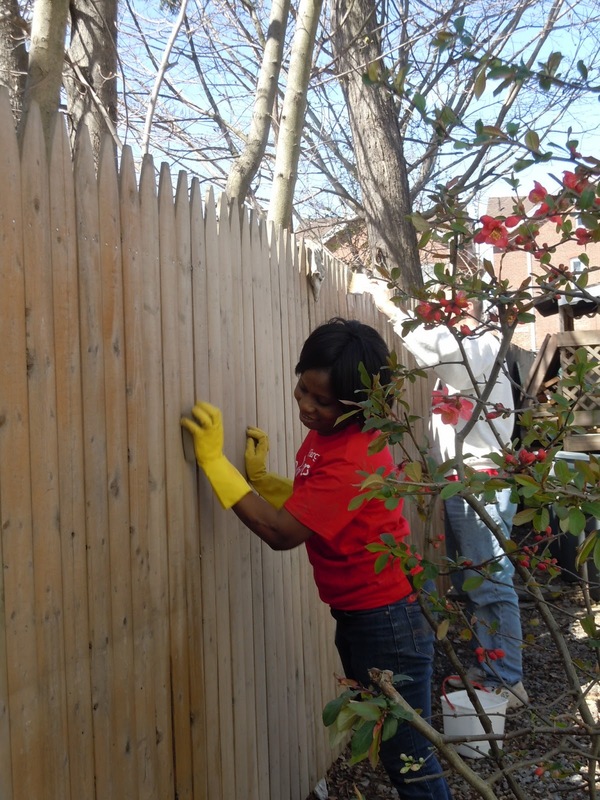 Wells Fargo, thank you so much for all of your hard work and expert hands! It’s always a joy having such capable people help out with challenging projects in our communities, and Wells Fargo really knew how to do things right. Cheers to a job well done! What a great time we had this past Saturday in Newhallville! If you were in the area between 10:00am and 4:00pm you should have seen, and heard, some positive activity happening on Lilac Street. 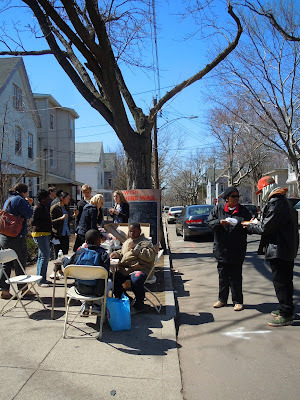 With Yale students, some of the NHS staff, local DJ Tootske, Lilac Street residents, a group of volunteers, and neighboring passersby all present, we had the street hopping! Over the past few weeks, a few of our staff here at NHS have had the opportunity to meet with 1st year Yale architecture students as they prepared a community engagement project. Meeting community members and hearing input from the residents of Newhallville was important for these students, as they are currently designing a house that will fit on a sliver lot (30 feet wide or less). Every year Neighborhood Housing Services of New Haven partners with the Yale School of Architecture for one of these design projects. NHS obtains a vacant lot, and then Yale architecture students propose plans for a house to be built on that lot. 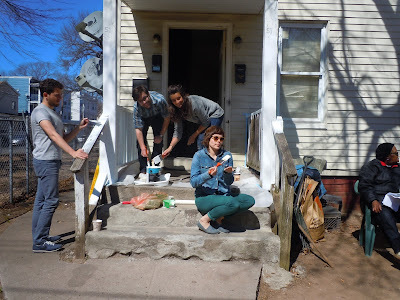 We select the design we feel will best integrate with the neighborhood, and then the Yale students play a big role in the construction and landscaping of the house. Like all of our houses, the Yale Building Project will end up as the home of a first-time homebuyer. 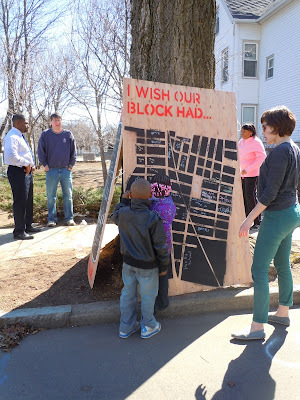 The vacant lot at 32 Lilac Street will be the location of the 2013 Yale Building Project, but we know that there are many vacant lots throughout New Haven that are not destined for houses or for anything at all. The Yale architecture students structured their community engagement project so that it would open discussion within the neighborhoods to brainstorm the possibilities for these vacant lots. The students also wanted to encourage residents to speak up about what assets they would like to have in their neighborhoods. The collaboration that took place to make this project happen was fantastic to see. Students talked and met with key city officials and a few vocal residents to hear their ideas about having a street event. 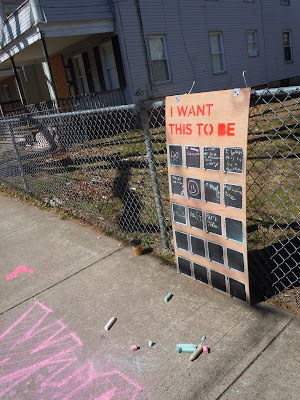 Engaging chalkboards were made and set-up on Lilac Street with open-ended statements for residents to fill in, such as “I wish there was ___ in Newhallville,” “I wish our block had ___” and “I wish this (vacant lot) was ___.” From what we gathered, people would love Newhallville to get the following: jobs, gun control, a teen center, an arts building, and educational programs. 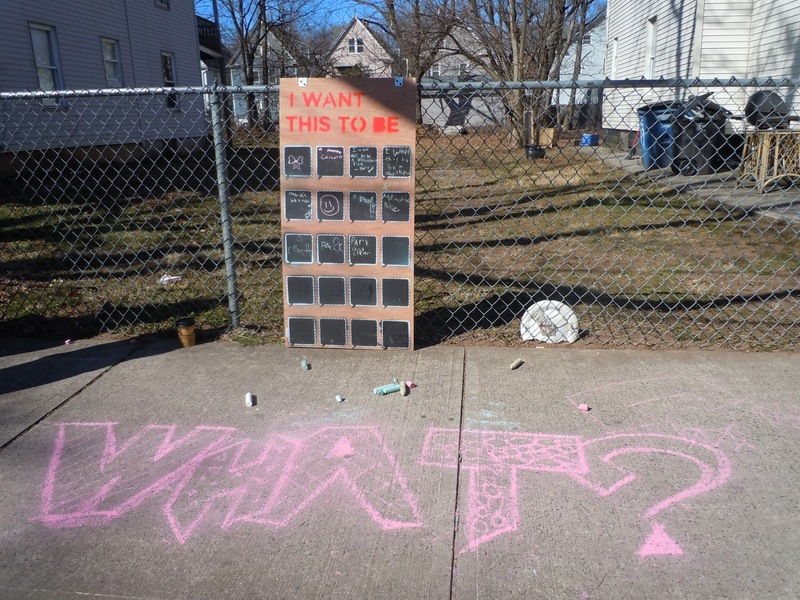 While there were some great ideas made by parents and other adults, the responses, and pictures, that were provided by the children of the neighborhood were amazingly creative. One contribution from the younger generation included a request for a dirt bike park! Everyone truly enjoyed the music that played throughout the day. Best of all, this was a fantastic opportunity to connect with local residents and see what they want most in the neighborhood they call home. It was great to see so many people out and about! 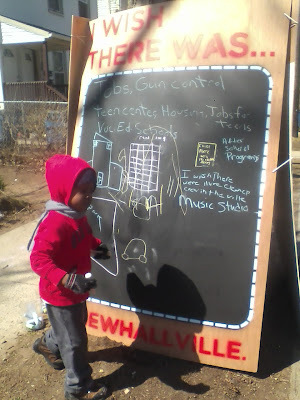 If all this wasn’t enough, we also had volunteers doing projects in the area while the Yale students engaged residents with their chalkboards. Yale Dwight Hall offered their hands and sweat to help NHS in our ongoing efforts to help local residents obtain front yard light posts. These lamp posts add beauty and safety lighting to the yards of these residents. The amazing volunteers from Yale Dwight Hall spent the better part of four hours digging the holes and trenches for these lamp posts. At the same time, a few other Yale students volunteered to apply a fresh coat of white paint to the front porch of a Lilac Street house. 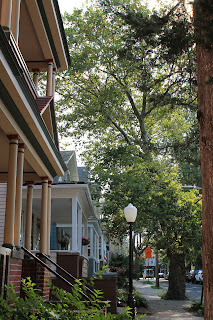 The students chatted up residents and spruced up the porch until it looked striking and appealing. 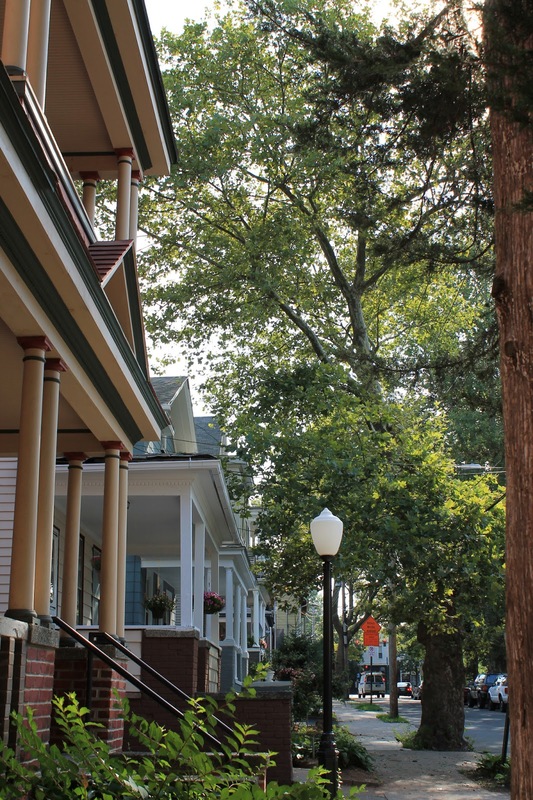 By making porches more attractive, we hope to get people to spend more time on their porches, engaging their neighborhoods and connecting with each other. Thank you so much to the volunteers who came out on Saturday and made our events such successes! We look forward to more activities like this in the future. What do you want in your neighborhood? In the second unit of this year’s Resident Leadership Program (RLP), Leslie Radcliffe took center stage. A longtime resident of the Hill neighborhood, Leslie is a tried and true community leader who never hesitates on taking the lead in her community. As an instructor in our RLP, her take-charge attitude fully engaged our participants. Leslie started the class with an exercise in active listening. Participants interviewed each other for five minutes each and, without taking notes, had to summarize their partner’s traits to the rest of the class. This activity emphasized the importance of truly listening to another person, instead of focusing on wording your reply to their words. Group participation was vital to this class, and no one shied away from addressing the group. Class attendees defined the word “assets” (“an advantageous resource”) before mentioning some general assets of their Connecticut communities. The class then broke up into smaller groups to address questions of needs and strengths in their smaller communities. Leslie encouraged the groups to compare these lists, making connections between an identified need and a recognizable strength in the community. For example, if one list cited the need for safe gathering places, the class pointed to another list that celebrated churches and libraries and wonderful gathering places. It is important, Leslie pointed out, to take stock of all that your community has to offer and focus on its positive attributes, before dwelling on what your community lacks. You may be surprised to discover that your needs are not impossible to satisfy when you remember that your community has assets like alderpersons, local businesses, and a sense of connectivity. Afterwards, the class watched a brief video: a case study of Savannah, Georgia. In the 1970s, Savannah was suffering due to deteriorating housing stock, a lack of safety, and a loss of culture. “We were losing our community,” one Savannah resident remarked in the video. When the city shifted gears and urged Savannah residents to take charge of their neighborhoods, however, residents became aware of just how many assets they had at their disposal. Long-standing connections among residents became the building blocks of neighborhoods eager to revitalize their communities by engaging City Hall and each other. In its current state, Savannah looks much different than it did in the 1970s, and the residents are still rallied around the power of community organizing. Class participants then had a lively discussion of what a community should tackle first – its needs or its assets. This led to a chicken-and-egg discussion that eventually concluded on a note of balance and moderation. Needs must first be identified, true, but once the assets available to the community are laid out, the need may be further refined or expanded. Needs and assets are a continuous interplay essential to all community organizing. By staying positive, though, great things can happen. Thank you to all of our RLP participants and to Leslie for making this class exciting and memorable! We have been hearing about Earth Day since it was initiated in 1970 as part of the environmental awakening during the second half of the 20th century. Although the history of the environmental movement runs much further back in our history, by the 1960s our industrial prosperity had created a legacy of environmental degradation: choking air, filthy water, waste washing up on beaches, burgeoning landfills, acid rain, rampant sprawl, and all the related health problems. We addressed these visible aspects of the environmental problem but were largely unaware that an invisible, odorless menace was a part of the emerging threat to our planet. Way back from the early days of the modern environmental movement, a small community of scientists was concerned about the concentration of carbon dioxide in the atmosphere. Over the years the levels have risen far above historic levels. Pre-industrial levels of CO2 were around 280 PPM (parts per million), and now they are headed for 400 PPM, higher than anytime in the last 650,000 years. CO2 levels continue to rise more rapidly than anyone has predicted. Why is CO2 a problem? Although CO2 will not kill you like other pollutants, its global effect on the planet is extremely damaging because of its impact on the earth’s climate. CO2 traps the sun’s heat in our atmosphere and raises the earth’s temperature. This drastically affects the habitats of all forms of life while also causing disruption and extinction. It has, and will, influence agriculture, food supplies, transportation, industry, the economy, and even where we choose to live. You may ask: What does this have to do with me? It has everything to do with each one of us, since, in addition to being the victims of this problem, we are also the cause. Almost everything we do has what is called a “Carbon Footprint.” What we eat, wear, drive, purchase, discard, live in, work in, and do (including breathing) releases carbon into the atmosphere. Therefore, the goal is to reduce, as much as possible, the amount of carbon that results from our choices and lifestyles. Remember, each of us is one of 7 billion people on the globe. Although the impact of our choices may be tiny in relation to the problems, it is important to take advantage of the choices that are available to us to reduce our personal impacts. One by one, those impacts and better choices will add up to make a difference. It will take an increased awareness by people around the world to pull us back from the brink of what could be potentially life-threatening. 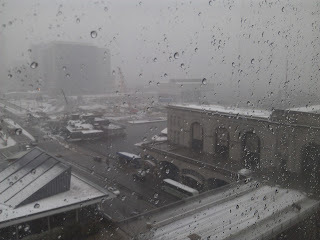 It was an early morning on March 6th when members of the Rehab Department and the AmeriCorps VISTA interns began the trek to Boston, MA, for the Northeast Sustainable Energy Association (NESEA) BuildingEnergy13 conference. An annual pilgrimage, the conference offers a trade show, educational seminars, and networking opportunities for professionals and municipal officials focused on the creation of sustainable buildings and environments. For the NHS Rehab Department staff, it is a couple of days to debate, investigate, learn, and then debate some more with similar-minded (but not always like-minded) members of the sustainability field. 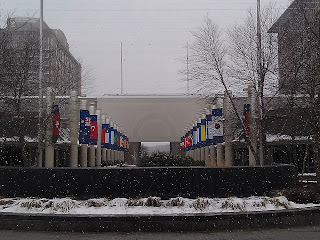 Flags and snow greet conference participants. The Building Energy Conference offers ten tracks varying in focus from “Homes” to “Retrofit for Resilience – Cities” to “Cutting Edge: What the Pros Want to Know.” The trending message throughout the workshops was angled towards resiliency and practical, beneficial construction techniques for a more prepared, aware, and sustainable future. One of the great features of the BuildingEnergy conference is that the seminars are required to be data-driven, with clear presentation of the facts on which discussions and conclusions are based. Those in the group like Henry Dynia and Kathy Fay, veterans of the Building Energy conferences, noticed a focus shift this year – away from touting high-cost, high-efficiency specialized practices to an increased emphasis on conservation for the masses. 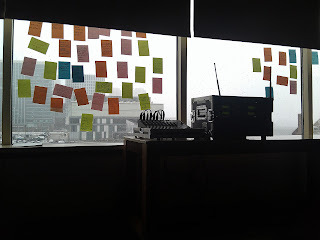 Brainstorming via post-its at one Track 4 class. Sustainability matters were discussed on both the macro- and micro- scale. In a case study of Northampton, MA, one sustainability practice focused on innovative engagement with the public, including Northampton employing a bicycle-driven garbage removal program! 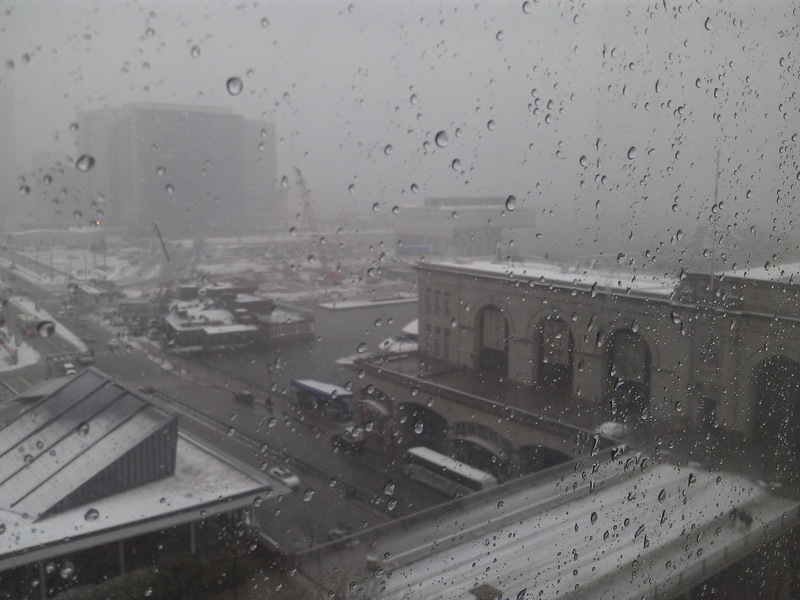 Although not always in agreement about methodology, the point was made quite clear that cities and regions must be prepared for future climate change-driven extreme weather events such as increased snowfall, high winds and flooding. The disasters which confronted the Northeast just this past year all indicate such climate changes. A true wake-up call came from the presentation of Hilary Beber, NYC Mayor’s Office of Long-Term Planning and Sustainability and Lesley Patrick, CUNY’s Institute for Sustainability. Their discourse underscored Hurricane Sandy’s eradication of FEMA map predictions on storm surges. An eye-opening workshop featured a discussion on “Measured Retrofit Results: 10 Simple Things That Work, 10 Simple Things That Don’t.” After commissioning and testing, many myths that persist in construction either hold up or do not. In most cases the fact remains that retrofits must be analyzed on a case-by-case basis to provide the best measured benefits for maximized “bang for your buck.” Another excellent workshop focused on water conservation in the home, including the energy costs of water use. The weather was not so friendly to our staffers. In addition to the conference itself, Boston provided the perfect backdrop to a driving/ walking tour that included the Big Dig, Leonard P. Zakim Bunker Hill Bridge, Cambridge, Quincy Market, City Hall, and more! A most appreciative “thank you” must be given to Henry Dynia for not only guiding the NHS expedition but for providing exceptional driving prowess through a blizzard to return everyone safe and sound to New Haven.